Chef d'orchestre US né Julius Frank Anthony Kuczynski, le 18 Février 1914 à Abrams (Wisconsin). 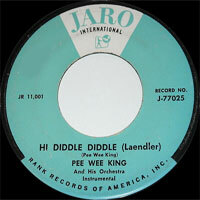 Pee Wee King apprend tout jeune l'harmonica, le fiddle et l'accordéon. A 14 ans, il se produit dans les radios locales et en 1934, il rencontre Gene Autry qui l'embauche comme accordéoniste et fiddle. Autry, appelé à Hollywood, Pee Wee monte son propre orchestre: les "Golden West Cowboys", groupe légendaire dont feront parti des chanteurs comme Eddie Arnold, Cowboy Copas et Ernest Tubb!!! Pee Wee King fut élu au Country Music Hall Of Fame en 1974. Pee Wee eut un show à la télé (WBBM-TV, Chicago, Illinois). Il est décédé le 7 Mars 2000 à Louisville (Kentucky). A flamboyant and influential figure during his heyday, Pee Wee King remains somewhat underappreciated as a performer, though his fame as a songwriter is assured thanks to the smash hit "Tennessee Waltz." King helped modernize the sound and style of country music; he introduced electric instruments, drums, and horns to the notoriously conservative Grand Ole Opry, and dressed his band in sharply tailored, Western-style Nudie suits that looked anything but backwoods. Despite his affinity for Western swing and cowboy songs, King actually came from Polish extraction, which helped account for his eclectic approach to country music. He was born Julius Frank Anthony Kuczynski on February 18, 1914, in Milwaukee, and grew up in the northern Wisconsin town of Abrams (or possibly vice versa, according to some sources). His father headed a polka band, and young Frank (as he was called) eventually joined up, learning both fiddle and accordion but concentrating on the latter instrument. He made his professional radio debut at age 14, and eventually started leading his own band, adopting the name Frank King (in tribute to polka bandleader Wayne King) and playing a mixture of polkas and cowboy songs. 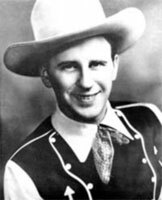 Starting in 1933, his band played regularly on the Milwaukee radio show The Badger State Barn Dance, where they were discovered by an up-and-coming Gene Autry. 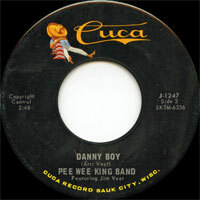 Autry hired them as his backup band, and nicknamed King "Pee Wee" for his five-foot six-inch height. In 1934, Autry and King became regulars on Louisville radio, but Autry soon departed for Hollywood. King elected to stay behind in Louisville, and played with the Log Cabin Boys in 1935; the following year, he formed his own band, the Golden West Cowboys, which initially featured fiddler Abner Sims, guitarist Curly Rhodes, and singer Texas Daisy. 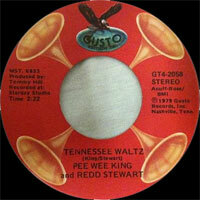 In 1937, fiddler Redd Stewart joined the lineup, and would later become King's songwriting partner. Just as importantly, the group was invited to join the Grand Ole Opry. They were an unorthodox selection that made traditionalists uncomfortable: not just for their wardrobe, but also for their flashy, professional showmanship and for the polka and waltz rhythms that drove some of their songs. 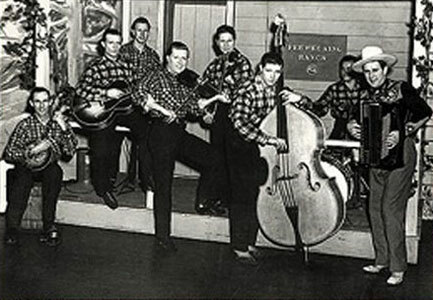 They remained regulars over the next ten years, during which time King also hosted his own radio show in Knoxville; they also evolved into more of a Western swing band. King first used an amplified electric guitar on-stage at the Opry in 1940, and introduced drums to the Opry stage in 1947. During that run, several prominent Vocalsists passed through the ranks of the Golden West Cowboys, including Eddy Arnold, Cowboy Copas, Milton Estes, Tommy Sosebee, and Becky Barfield. the Golden West Cowboys recorded and toured as Minnie Pearl's backing band over 1941-1942, and worked with Ernest Tubb as well. Additionally, King appeared in several Westerns playing himself as a bandleader; the first was 1938's Gold Mine in the Sky, starring his old friend Gene Autry. A new era for the band started in 1947. King left the Grand Ole Opry to return to Louisville and host his own TV show, which ran for the next ten years and was picked up nationally by ABC in the final two seasons. King also signed a recording contract with RCA, and Redd Stewart took over the lead Vocals chores. 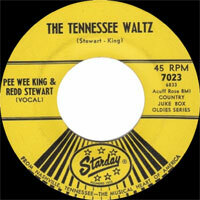 Inspired by Bill Monroe's hit "Kentucky Waltz," King and Stewart penned lyrics to an instrumental tune they'd been playing; recorded in December 1947, "Tennessee Waltz" became a number three hit for King the following year. Pop singer Patti Page cut her own version in 1950 and it was an enormous hit, topping the pop charts and selling several million copies; it ranked as one of the biggest country crossovers ever. 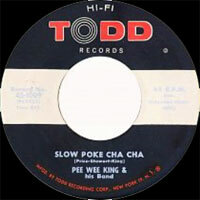 King followed it in 1951 with "Slow Poke," a novelty tune that topped both the country and pop charts, spending over three months at number one. Other hit King compositions included "Silver and Gold" (1952), "Changing Partners" (1954), "Bonaparte's Retreat," "You Belong to Me," "Walk By the River," "Busybody," and "Bimbo," among others. King also returned to the movies, appearing in a couple of Charles Starrett Westerns during the early '50s. King's run of commercial success tailed off after 1954; his TV show went off the air in 1957, and he continued to record for RCA until 1959. From then until 1963, he reunited with Minnie Pearl and led the Golden West Cowboys as her supporting band. 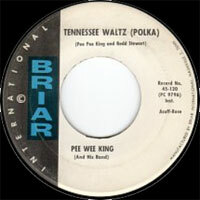 In 1965, Tennessee adopted "Tennessee Waltz" as its official state song. King broke up the Golden West Cowboys in 1969 and went to work for the Country Music Foundation, at one point serving as its director. He was elected to the Country Music Hall of Fame in 1974, later serving on its board of directors, and also made it into the Nashville Songwriters Hall of Fame. King passed away in Louisville on March 7, 2000, after suffering a heart attack. 06/1946 78 t. BULLET 614 (US) . 01/1947 78 t. RCA VICTOR 20-2111 (US) . 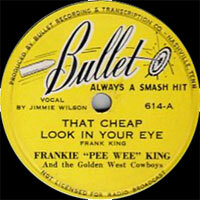 03/1947 78 t. RCA VICTOR 20-2212 (US) . 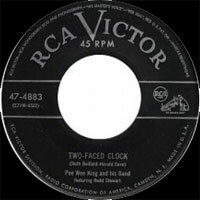 05/1947 78 t. RCA VICTOR 20-2263 (US) . 08/1947 78 t. RCA VICTOR 20-2366 (US) . 11/1947 78 t. RCA VICTOR 20-2520 (US) . 01/1948 78 t. RCA VICTOR 20-2680 (US) . 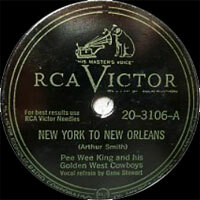 02/1948 78 t. RCA VICTOR 20-2727 (US) . 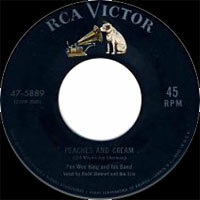 04/1948 78 t. RCA VICTOR 20-2841 (US) . 07/1948 78 t. RCA VICTOR 20-2995 (US) . 09/1948 78 t. RCA VICTOR 20-3106 (US) . 11/1948 78 t. RCA VICTOR 20-3232 (US) . 01/1949 78 t. RCA VICTOR 21-0004 (US) . 04/1949 SP RCA VICTOR 48-0037 (US) . 04/1950 SP RCA VICTOR 48-0307 (US) . 05/1950 SP RCA VICTOR 48-0332 (US) . 07/1950 SP RCA VICTOR 48-0354 (US) . 08/1950 SP RCA VICTOR 48-0379 (US) . 01/1952 SP RCA VICTOR 47-4458 (US) . 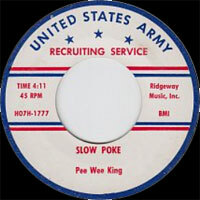 01/1954 SP RCA VICTOR 47-5587 (US) . 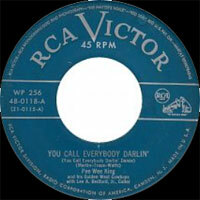 02/1954 78 t. RCA VICTOR 20-5632 (US) . Pee Wee King & His Band featuring Redd Stewart - Huggin' My Pillow (And Dreaming Of You) / Why Don't Y'all Go Home? 02/1954 SP RCA VICTOR 47-5632 (US) . Pee Wee King & His Band featuring Redd Stewart - Huggin' My Pillow (And Dreaming Of You) / Why Don't Y'all Go Home? 04/1954 SP RCA VICTOR 47-5694 (US) . 07/1954 78 t. RCA VICTOR 20-5782 (US) . Pee Wee King & His Band - In A Garden Of Roses / How Long? 07/1954 SP RCA VICTOR 47-5782 (US) . 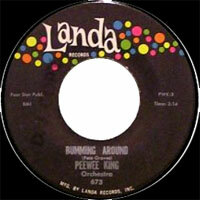 Pee Wee King & His Band - In A Garden Of Roses / How Long? 09/1954 SP RCA VICTOR 47-5847 (US) . 10/1954 SP RCA VICTOR 47-5889 (US) . 03/1955 SP RCA VICTOR 47-6054 (US) . 08/1955 SP RCA VICTOR 47-6233 (US) . 11/1955 SP RCA VICTOR 47-6302 (US) . 01/1957 SP RCA VICTOR 47-6793 (US) . 03/1959 SP TODD 1009 (US) . 1959 SP TODD 1020 (US) . 1960 SP Jaro Int. J 77025 (US) . 1960 SP TOP RANK RA 2087 (US) . 1961 SP LANDA 668 (US) . 1961 SP LANDA 673 (US) . 10/1961 SP BRIAR 45-120 (US) . 03/1964 SP STARDAY 668 (US) . 1964 SP STARDAY 7016 (US) . 1964 SP CUCA J-1182 (US) . 1965 SP CUCA J-1207 (US) . 1965 SP CUCA J-1247 (US) . 1966 SP CUCA J-1275 (US) . 1968 SP CUCA 1420 (US) . CD 1 : This Is Pee Wee King / I Love The Way You Roll Them Eyes At Me / The Reason I'm In Love With You / Ramblin' Blues / I'm Goin' Back To The Middle Of The Middle West / One Way Street / I'll Never Love No One But You / You Tried To Ruin My Name / Get Together Polka / Rootin' Tootin' Santa Claus / There's A Moon In The Sky / Slowpoke / Empty Vows / Oh Monah / Blow Out All The Candles / Between You And The Birds And The Bees And Cupid / Western Limited / Brother Drop Dead Boogie / Doghouse Blues / Cowboy Special / Steel Guitar Waltz / 'Tain't What You Want / Hog Wild Too / I Don't Know Why I Should Love You / Postage Due / Subdued Mood / If And When / "We've Just About Reached The Half-Way Point"
CD 2 : Fool's Gold / Silver And Gold / Sweetest Little Girl / Darling Don't Cry / Flower Of Texas / I Wanna Say Hello / Let Me Hold You When You're Blue / Where Oh Where Has My Little Love Gone / I Need A Lot Of Lovin' / Where Were You Last Night / I'm Just A Gad-About / Song Of The Early Settlers / Take These Shackles From My Heart / The Calendar Song / Don't Apologize To Me / Charleston Alley / Opportunity / Rich In Love / I Can't Feel Those Kisses In Your Letters / Mohegas / Tadpole / Your Kisses Aren't Kisses Anymore / Tennessee Tango / Darling, Stop Playing With My Heart / Tears, Tears, Tears / "There's That Man With The Stopwatch."